After the worst December for stocks since the Great Depression, which saw the S&P500 tip into bear market territory if only for a few seconds on December 24, the market enjoyed a furious rebound last month, when it climbed 7.9%, the best January return since 1987, a fact that was not lost on president Trump who last week returned to tweeting about the market after taking a 3 month hiatus during the Q4 swoon. Of course, as extensively discussed here and elsewhere, this miraculous rebound was entirely due to the Fed's bizarre, according to some laughable dovish reversal, which put rate hikes on hold at least until the summer if not indefinitely with the market now officially expecting the Fed to cut rates in early 2020 when the recession hits, paradoxically giving stocks a green light to keep levitating up until the point the US economy contracts if not beyond: after all at some point, the Fed will have to launch QE4, and that as every shoeshine boy knows, is bullish for stocks which long ago ceased to reflect the economy and merely rise and fall based on how much liquidity the Fed is injecting or draining from the market. 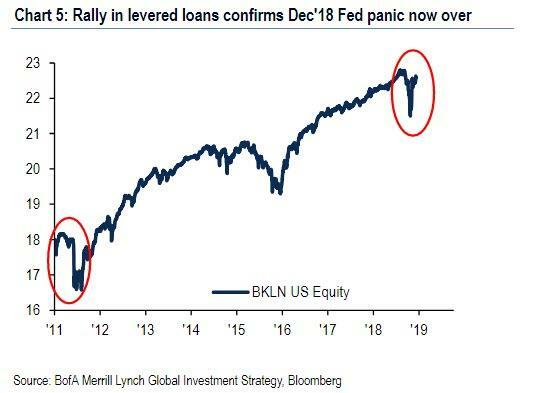 And yet, something strange happened: as we described last week, at a time when stocks continued to surge, investors were not buying it, literally, and the market's latest miraculous recovery saw wildly risk-off flows with $9.4 billion allocated to bonds while $15.0 billion was pulled out of equities. Fast forward one week when the "strangeness" has continued, and according to the latest weekly EPFR fund flow data as compiled by Bank of America, the investor flight from equities has continued despite what, until two days ago, was a historic rally. According to BofA's Michael Hartnett, since the January 2 week that saw the bear market lows, investors have bought $36bn of bonds and have sold $10bn of equities, confirming again that the investing public has no faith in the dramatic 6 week rally. To be sure, we are not the only ones puzzled by this bizarre investor behavior: one week ago, Deutsche Bank's flow expert Parag Thatte was scratching his head noting that "there have been very few periods when the market rose more than 5% accompanied by outflows. In two of those periods, after the early 2016 growth panic and the European financial crisis, inflows eventually returned with a few weeks lag. An exception was in early 2015 when outflows persisted as US data continued to weaken significantly." 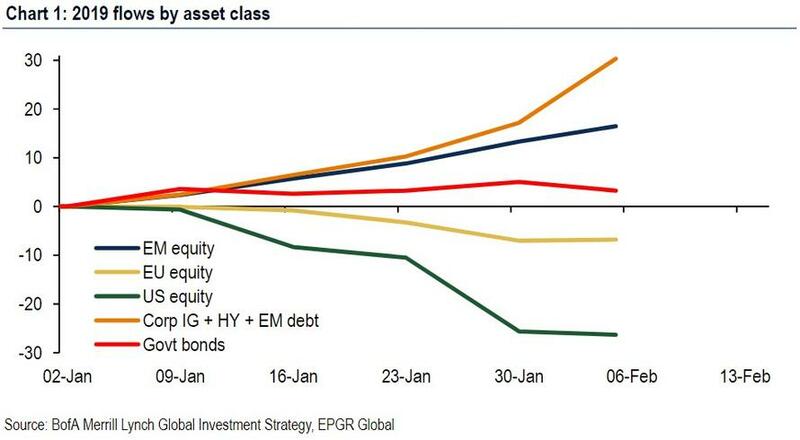 And now we can add January 2019 to this list: specifically, while investors bought $30 billion of IG/HY/EM bonds, $16 billion of EM equities, $3bn of government bonds, they sold $26 billion of US equities & $7 billion of European equities. To be sure, it hasn't been a wholesale risk revulsion, because among the US equity outflows, we saw the biggest week of inflows to HY bonds ($4.8bn) and EM debt ($4.4bn) in 3 years, as well as another week of chunky inflows to IG bonds ($4.0bn); as well as the second largest week ever of inflows to REITs ($1.9bn). 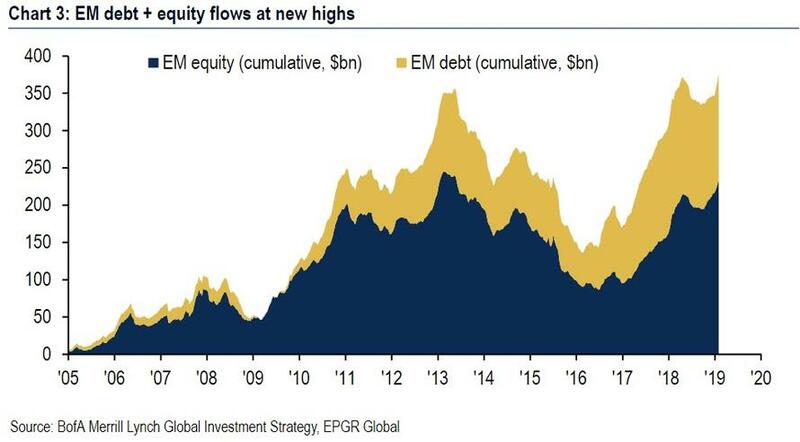 Meanwhile, combined inflows to EM equity & bonds just hit an all-time highs this week. So what gives? According to Hartnett there may be two explanations for the bizarre revulsion toward US equity stocks. First, despite the equity surge, investors are back to discounting secular stagnation and buying "yield" & "growth" in the form of EM markets and fixed income. Second, the recent flows show a clear rush back to credit but not equity, where an "imminent retest of lows" view still prevalent. However, despite the investing public's ongoing skepticism, Hartnett, who for the most part of 2018 was quite bearish on risk assets, is confident that it's only a matter of time before everyone jumps back into the pool for one simple reason, arguably the most important one of all: the global central bank tightening cycle is now ending (rolling 6-month rate hike tally peaked at 33 hikes in Oct'18, now 23), while the Fed panic over a global "credit event" worked, noting that the epicenter of pain, levered loans, are now back near all time highs. Finally, there are more policy "jokers" yet to come, including: Fed ends QT, China ends shadow banking de-lever, trade truce, German fiscal stimulus to offset imminent rise in German unemployment. In summary: the smart money thinks the dumb money is wrong, and yet over the past decade it was the dumb money that solidly outperformed the 2 and 20 crowd. Can they do it again, and if this time investors are saying the Fed is about to lose credibility and equities are to be sold not bought, what hope is there that the Fed can arrest the next market downturn?